Stringy's Running Blog: Lightning strikes next Sunday! With less than a week to go before I run for 12 hours! I'm feeling pretty relaxed about it. I'm physically not prepared but I'm mentally ready to rock 'n' roll. How many miles will I do? I have no idea. 30, 40 or even 50? 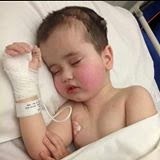 On 15th July 2010, aged 7 months old, Luke was diagnosed with a visual pathway glioma (a brain tumour on his optic nerve). Since then he's had numerous operations, chemotherapy and has had a really tough time. I've never asked anyone for sponsorship since I've started running, but I'm doing it now for the very first time. 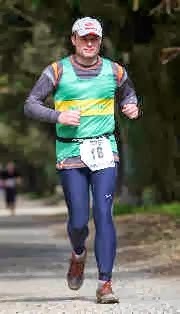 I'm running my second ever ultramarathon (and encompassing my second ever marathon) on 4th May. The race starts at 6am and continues for 12 hours. The challenge is to run as many miles in 12 hours. It's all off road trails and is very, very hilly. For every mile I run, may I ask that you pledge 30p to Lukes fund. To put it into context. My longest run since October is 6.5 mile and I've only just got back into regular running. It's going to be a huge physical and mental challenge but nothing, and I mean nothing, to what Luke is going through and will do for a long time. I'll run, walk, shuffle or crawl for the 12 hours so please, please, do what you can. I'll be updating my progress on Facebook as the race progresses. Good luck you damn craxy fool !